The Raising of Jairus’s Daughter by Iliya Efimovich Repin, ca. 1871. 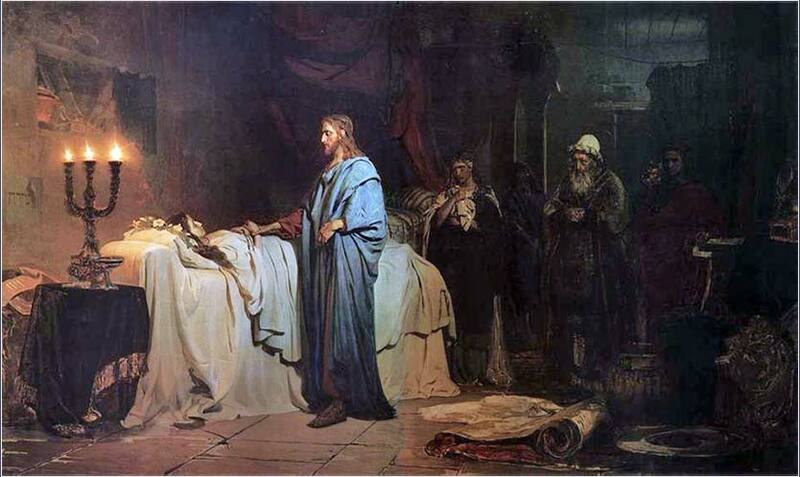 One of Christs’ most touching resurrections, that of Jairus’ daughter (Matthew 9:18–26). 202 people in our community are currently praying with you. O Lord our God, most mighty and merciful father, I, your unworthy creation and servant, once more approach your presence. Though not worthy to appear before you, because of the many sins and transgressions which I have committed against your divine majesty; yet I pray you, for the sake of him in whom you are well pleased, the Lord Jesus Christ, to let me give you thanks and praise for your many and varied mercies extended toward me, for the quiet rest and repose of the past night, for food, clothing, health, peace, liberty, and the hopes of a better life through the merits of your dear son's bitter passion. And O kind Father, continue your mercy and favor to me this day, and always; give resolution to all my lawful undertakings; let me have all my directions from your Holy Spirit; and success from your bountiful hand. Let the bright beams of your light so shine into my heart, and enlighten my mind in understanding your blessed word, that I may be enabled to perform your will in all things, and effectively resist all temptations of the world, the flesh and the devil. Preserve and defend our rulers in church and state. Bless the people of this land, be a father to the fatherless, a comforter to the comfortless, a deliverer to the captives, and a physician to the sick. Let your blessings guide me and all of us, this day and forever, through Jesus Christ, in whose name I pray. They just didn't get it. They were shocked when Jesus' tomb was found empty and they did not believe he had risen. (Mark 16:11) Thomas famously would not believe his own eyes and ears; he simply could not believe the resurrected Jesus was standing in front of him, until he put his finger in Christ's wound. This helps us to understand why we, ourselves, sometimes find it so difficult to conform ourselves to Christ's commandments. Both our nature and our experience fight our spirit throughout our lives. It seems to be this last problem that plagued the disciples. They appear to have disentangled themselves from the world successfully, and they seem sober-minded and focused. But they sometimes seem downright doltish. In today's Scripture, they seem to finally begin to accept, grudgingly, that Jesus will die in Jerusalem; and yet, they still do not really believe he will be resurrected, even after they have seen him repeatedly raise others from the dead. The concept of entanglement is itself perplexing. Why do we, in our most productive years, insist on spending our time and energy pursuing a goal that will leave us unsatisfied? C. S. Lewis tells us, in his sermon the The Weight of Glory , that God put something within us that cannot be found in earthly life. Trying to find real fulfillment in the world is neither possible nor advisable. And yet, almost everyone seems to spend his most productive years doing exactly that. But the apostles' big hurdle, and something we all understand, is that once we learn something, trying to learn that it is not true can be nearly impossible, even if we are presented with insurmountable evidence. But you can teach an old dog new tricks, if the dog has a willing attitude; and this is an attitude that any Christian should keep until the day he dies. Openness, a sense of wonderment, and a constant hunger for growth prevent us from ever becoming stale and self-satisfied in our faith. 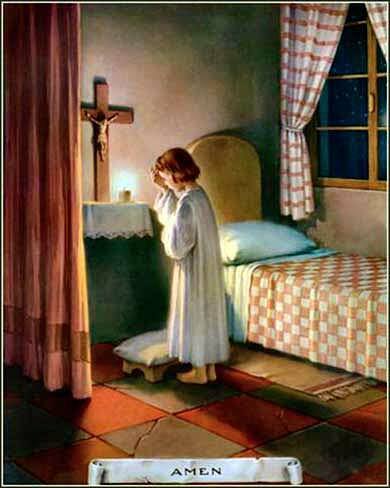 This old Catholic prayer card is unabashedly sentimental, but gives us a wonderful sense of the childish innocence with which Christ tells us to come to him.